I presented remotely to the Boston Area SharePoint User Group (BASPUG) tonight (7/13/2016), and I referenced an article that I had written that is no longer available online. 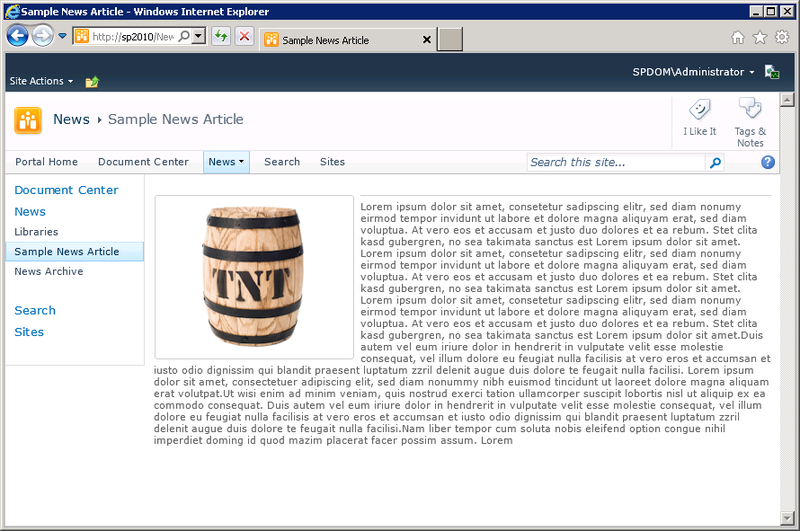 This post originally appeared as a “SharePoint Smarts” article from Idera. 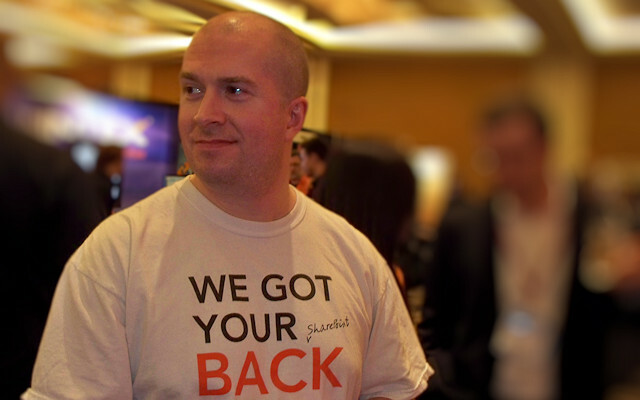 Idera is out of the SharePoint business nowadays, but the information I shared in that article is still relevant to those who use SharePoint 2010. So if you have a SharePoint 2010 environment and use the Office Web Apps, this post (and more specifically, the scripts contained within) is for you. 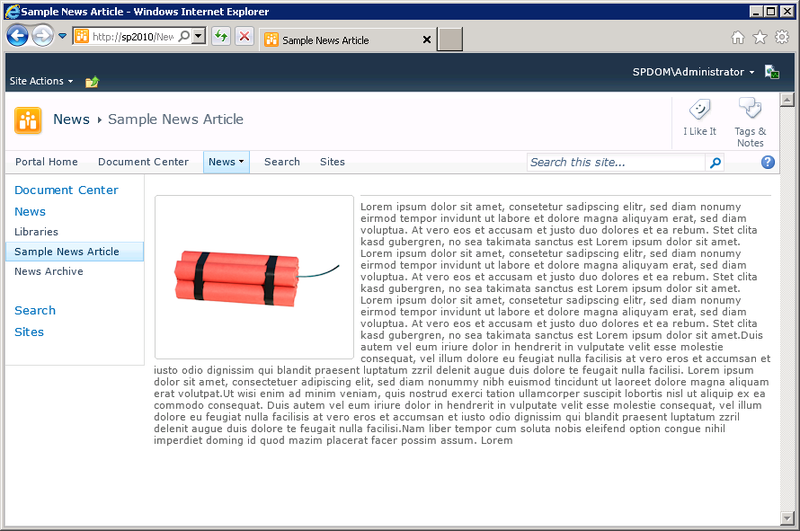 One of the hotly anticipated items in SharePoint 2010’s feature set is the introduction of the Microsoft Office Web Applications, or “Office Web Apps” for short. The release of the Office Web Apps opens up new possibilities for those who work with documents and files that are tied to Microsoft Word and other applications in the Microsoft Office Family. In prior versions of SharePoint, viewing and editing Office documents that existed in SharePoint document libraries normally required a client computer possessing the Microsoft Office suite of applications. If you wanted to view or edit a Word document that existed in SharePoint, for example, you needed Microsoft Word (or an equivalent application) installed on your computer. That situation changes with the arrival of the Office Web Apps. 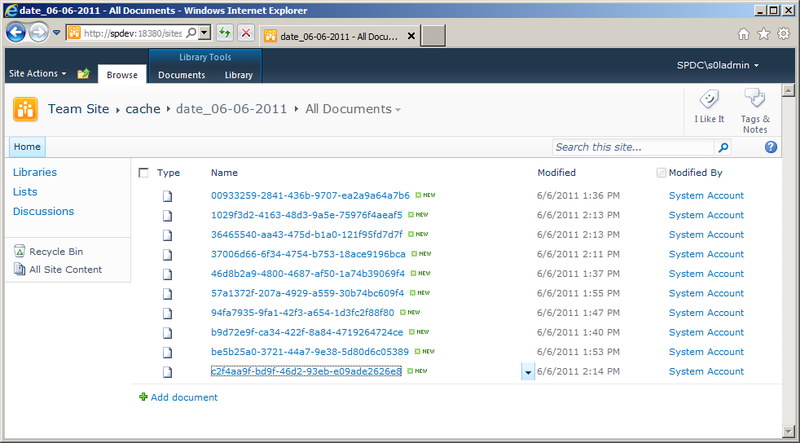 When a SharePoint 2010 farm is properly set up and configured with the Office Web Apps, it becomes possible to view and edit several different Office document types directly from within a browser as shown in Figure 1 below. The Office Web Apps provide browser-based viewing and editing support for Microsoft Excel, OneNote, PowerPoint, and Word document types, and this support extends to more than just Internet Explorer. Firefox 3.x, Safari 4.x, and Google Chrome browser types are also supported for viewing and editing – making the Office Web Apps an enabler of cross-platform collaboration that centers on Office documents. As you might imagine, browser-based rendering and editing of Office documents involves a number of complex processes that engage a variety of front-end, middle-tier, and back-end components. The front-end and middle-tier tasks that are tied to document viewing and editing are handled primarily by a new set of service applications that appear when the Office Web Apps are installed. These service applications (and their associated pages, handlers, and worker processes) take care of the business of document conversion, load-balancing, and rendering for browser consumption. Quick side note before going too far: the Office Web Apps cache is only employed for Word and PowerPoint document types. It is not used for OneNote or Excel documents. 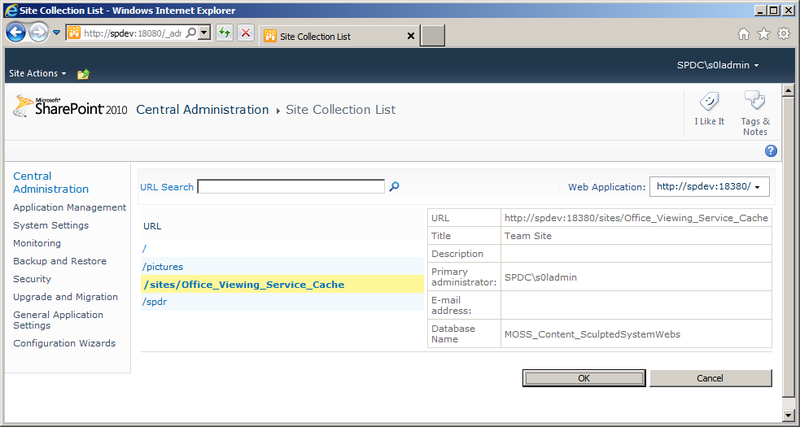 The Office Web Apps cache takes the form of a single site collection for each Web application within a SharePoint farm. When the Office Web Apps are installed and configured in a SharePoint environment, a couple of new timer jobs are installed and run regularly within the farm. One of those timer jobs, the Office Web Apps Cache Creation timer job, ensures that each Web application where the Office Web Apps are running has a site collection like the one shown below in Figure 2. The Office_Viewing_Service_Cache site collection is a standard Team Site, and it is the location where resources are stored following the conversion and rendering of either a Word or PowerPoint document by the Office Web Apps. The Team Site can be accessed just like any other SharePoint Team Site, and a glimpse inside the All Documents library (showing a number of document resources) appears below in Figure 3. For such a complex system, the Office Web Apps components do a pretty good job of maintaining themselves without external intervention. This extends to the site collections that are used by Office Web Apps for caching purposes, as well. For example, the Office Web Apps Expiration timer job that is installed with the Office Web Apps removes old document resources from cache site collections once they’ve hit a certain age. The timer job also ensures that each of the site collections responsible for caching has adequate space to serve its purpose. This doesn’t mean that there aren’t opportunities for tuning and maintenance, though. In fact, there are a couple of things that every administrator should do and review when it comes to the Office Web Apps cache. By default, the Office Web Apps Cache Creation timer job creates an Office_Viewing_Service_Cache site collection in a content database that is collocated with one or more of the “real” site collections within each of your content Web applications. Since the cache site collection is allowed to grow to a beefy 100GB by default, it makes sense to relocate the cache site collection to its own (new) content database. By relocating the cache site collection to its own content database, it becomes easy to exclude it from other maintenance such as backups. Relocating the cache site collection is pretty straightforward, and it can be accomplished pretty easily with following RelocateOwaCache.ps1 PowerShell script. Simply save the script, execute it, and supply the URL of a Web application within your farm where the Office Web Apps are running. The script will take care of creating a new content database within the Web application, and it will then move the Web application’s Office Web Apps cache site collection to the newly created content database. [string]$targetUrl = "$(Read-Host 'Target Web application URL [e.g. http://hostname]')"
# will serve as the basis for a new content database name. $newDbName = $cacheSite.ContentDatabase.Name + "_OWACache"
# user knows what's happening each step of the way. Write-Host "- creating a new content database ..."
Write-Host "- moving the Office Web Apps cache ..."
Write-Host "- performing required IISRESET ..."
Write-Host "Cache successfully relocated to the '$newDbName' database." When an Office_Viewing_Service_Cache site collection is provisioned within a Web application by the Office Web Apps Cache Creation timer job, it is initially configured to hold cached document resources for 30 days. As mentioned in Tip #1, a cache site collection can also grow to a maximum of 100GB by default. Whether or not these default settings are appropriate for a Web application depends primarily upon the nature of the site collections housed within the Web application. When site collections contain primarily static documents or content that changes infrequently, it makes sense to allow the cache to grow larger and expire content less often than normal. This maximizes the benefit obtained from caching since document content turns over less frequently. On the other hand, site collections that experience frequent document turnover and heavy collaboration traffic tend to benefit very little from large cache sizes and long expiration periods. In site collections of this nature, cached content tends to become stale quickly. Little benefit is derived from holding onto document resources that may only be good for days or even hours, so maximum cache size is reduced and expiration periods are shortened. 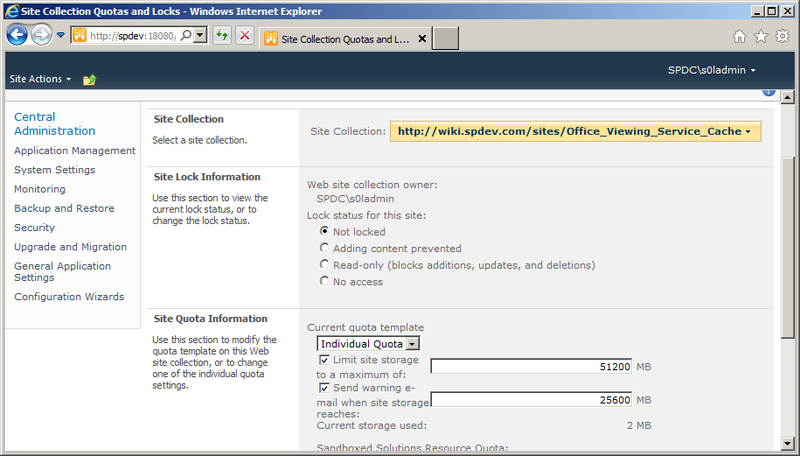 Since each Office Web App cache is a Team Site and like any other site collection, you can leverage standard SharePoint site collection features and capabilities to help you out. One such mechanism that can be of assistance is the ability to have an e-mail warning sent to site collection owners once a site collection’s size hits a predefined threshold. In the case of the Office Web Apps cache, such a warning could be a cue to increase the maximum size of the cache site collection or perhaps lower the expiration period for document resources housed within the site collection. Like the maximum cache size setting described in Tip #2, the ability to send e-mail warnings once the cache reaches a threshold is actually tied to SharePoint’s site collection quota capabilities. 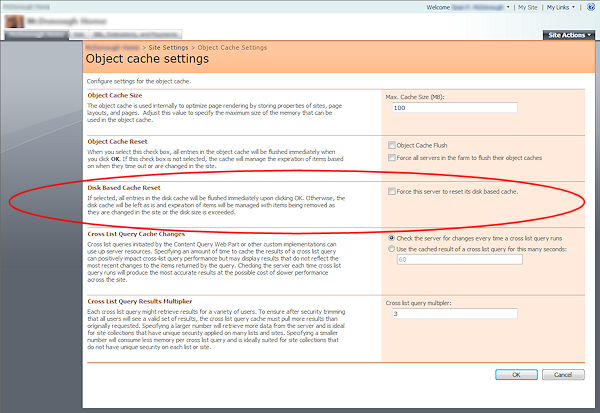 The maximum size of the cache site collection is handled as a storage quota, and the warning threshold maps directly to the quota’s warning threshold as shown below in Figure 4. In the case of Figure 4, a maximum cache size of 50GB is in effect for the cache site collection, and the e-mail warning threshold is set for 25GB. Tips #2 and #3 discussed some of the more straightforward Office Web Apps cache settings that are available to you, but you might be wondering how you actually go about changing them. The AdjustOwaCache.ps1 PowerShell script that appears below provides you with an easy way to review and change the settings discussed. Simply save the script, execute it, and supply the URL of the Web application containing the Office Web Apps cache you’d like to adjust. The script will show you the cache’s current settings and give you the opportunity to modify them. # working with and (potentially) altering. Write-Host "Current OWA cache values for '$targetUrl'"
Write-Host "-  Maximum Cache Size (GB): $wacSize"
Write-Host "-   Warning Threshold (GB): $wacWarn"
Write-Host "- Expiration Period (Days): $wacExpire"
# Give the user the option to make changes. $yesOrNo = Read-Host "Would you like to change one or more values? [y/n]"
[Int64]$newWacSize = Read-Host "-  Maximum Cache Size (GB)"
Write-Host  "-   Warning Threshold (GB)"
[Int64]$newWacWarn = Read-Host " (supply 0 for no warning)"
[int]$newWacExpire = Read-Host "- Expiration Period (Days)"
The Office Web Apps are a powerful addition to SharePoint 2010 and pave the way for greater collaboration on Office documents without the need for the Microsoft Office suite of client applications. The Office Web Apps cache is an important part of the larger Office Web Apps equation, and the cache is generally pretty good about taking care of itself. As shown in this article, though, it is still a good idea to relocate the cache from its default location. At the same time, a little bit of tuning and e-mail alerting can go a long way towards ensuring that the cache operates optimally for you in your environment. This post discusses how client-side caching and the max-attribute work with SharePoint BLOB caching. Client-server request/response interactions are covered, and some max-age watch-outs are also detailed. I first presented (in some organized capacity) on SharePoint’s platform caching capabilities at SharePoint Saturday Ozarks in June of 2010, and since that time I’ve consistently received a growing number of questions on the topic of SharePoint BLOB caching. When I start talking about BLOB caching itself, the area that seems to draw the greatest number of questions and “really?!? !” responses is the use of the max-age attribute and how it can profoundly impact client-server interactions. I’d been promising a number of people (including Todd Klindt and Becky Bertram) that I would write a post about the topic sometime soon, and recently decided that I had lollygagged around long enough. Before I go too far, though, I should probably explain why the max-age attribute is so special … and even before I do that, we need to agree on what “caching” is and does. By placing the data that is to be accessed on a faster storage medium; for example, taking frequently accessed data from a hard drive and placing it into memory. By placing the data that is to be accessed closer to the point of usage; for example, offloading files from a server that is halfway around the world to one that is local to the point of consumption to reduce round-trip latency and bandwidth concerns. For Internet traffic, this scenario can be addressed with edge caching through a content delivery network such as that which is offered by Akamai’s EdgePlatform. Oftentimes, data that is cached is expensive to fetch or computationally calculate. Take the digits in pi (3.1415926535 …) for example. Computing pi to 100 decimals requires a series of mathematical operations, and those operations take time. If the digits of pi are regularly requested or used by an application, it is probably better to compute those digits once and cache the sequence in memory than to calculate it on-demand each time the value is needed. Caching usually improves performance and scalability, and these ultimately tend to translate into a better user experience. Through its publishing infrastructure, SharePoint provides a number of different platform caching capabilities that can work wonders to improve performance and scalability. Note that yes, I did say “publishing infrastructure” – sorry, I’m not talking about Windows SharePoint Services 3 or SharePoint Foundation 2010 here. With any paid version of SharePoint, you get object caching, page output caching, and BLOB caching. 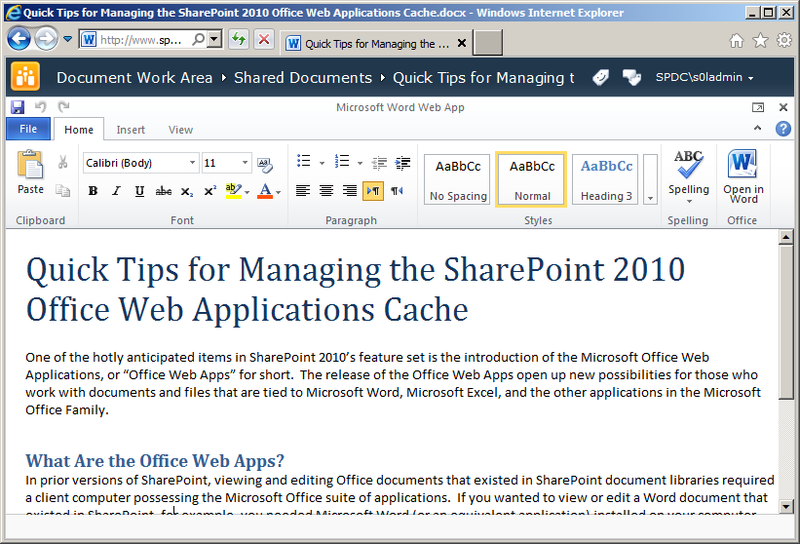 With SharePoint 2010 and the Office Web Applications, you also get the Office Web Applications Cache (for which I highly recommend this blog post written by Bill Baer). Each of these caching mechanisms and options work to improve performance within a SharePoint farm by using a combination of the two mechanisms I described earlier. Object caching stores frequently accessed property, query, and navigational data in memory on WFEs. Basic BLOB caching copies images, CSS, and similar resource data from content databases to the file system of WFEs. Page output caching piggybacks on ASP.NET page caching and holds SharePoint pages (which are expensive to render) in memory and serves them back to users. The Office Web Applications Cache stores the output of Word documents and PowerPoint presentations (which is expensive to render in web-accessible form) in a special site collection for subsequent re-use. Each of the aforementioned caching mechanisms yields some form of performance improvement within the SharePoint farm by reducing load or processing burden, and that’s all well and good … but do any of them improve performance outside of the SharePoint farm? What do I even mean by “outside of the SharePoint farm?” Well, consider a SharePoint farm that serves up content to external consumers – a standard/typical Internet presence web site. 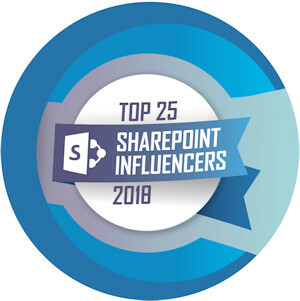 Most of us in the SharePoint universe have seen (or held up) the Hawaiian Airlines and Ferrari websites as examples of what SharePoint can do in a public-facing capacity. These are exactly the type of sites I am focused on when I ask about what caching can do outside of the SharePoint farm. For companies that host public-facing SharePoint sites, there is almost always a desire to reduce load and traffic into the web front-ends (WFEs) that serve up those sites. These companies are concerned with many of the same performance issues that concern SharePoint intranet sites, but public-facing sites have one additional concern that intranet sites typically don’t: Internet bandwidth. So … for all the platform caching options that SharePoint has, is there anything it can actually do to assist with the Internet bandwidth issue? As it turns out, the answer to that question is “yes” … and of course, it centers around BLOB caching and the max-age attribute specifically. 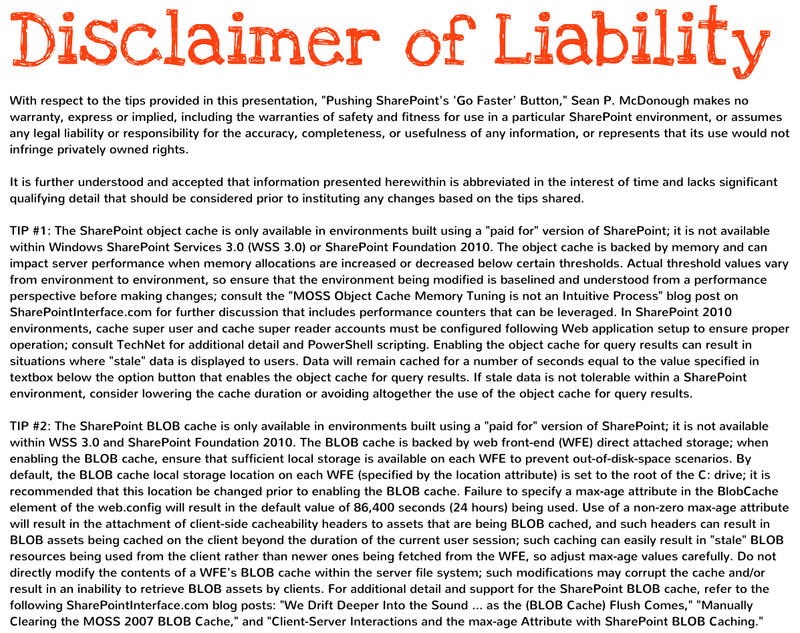 Let’s start by looking at the <BlobCache /> element that is present in every SharePoint Server 2010 web.config file. You’ll notice that I highlighted the Cache-Control header line. This line gives the requesting browser guidance on what it should and shouldn’t do with regard to caching the BLOB resource (typically an image, CSS file, etc.) it has requested. This particular combination basically tells the browser that it’s okay to cache the resource for the current user, but the resource shouldn’t be shared with other users or outside the current session. A request is made and a response is returned, but the HTTP 304 status code indicates that the requested resource wasn’t updated on the server; as a result, the browser can re-use its cached copy. Being able to re-use the cached copy is certainly an improvement over re-fetching it, but again: the cached copy is only used for the duration of the browser session – and only for the user who originally fetched it. The requester also has to contact the WFE to determine that the cached copy is still valid, so there’s the overhead of an additional round-trip to the WFE for each requested resource anytime a page is refreshed or re-rendered. The gray arrow that is shown indicates that at some point, an initial fetch of the BLOB resource is needed to populate the BLOB cache in the file system of the WFE. After that point, the resource is served directly from the WFE so that subsequent requests are handled locally for the duration of the browser session. 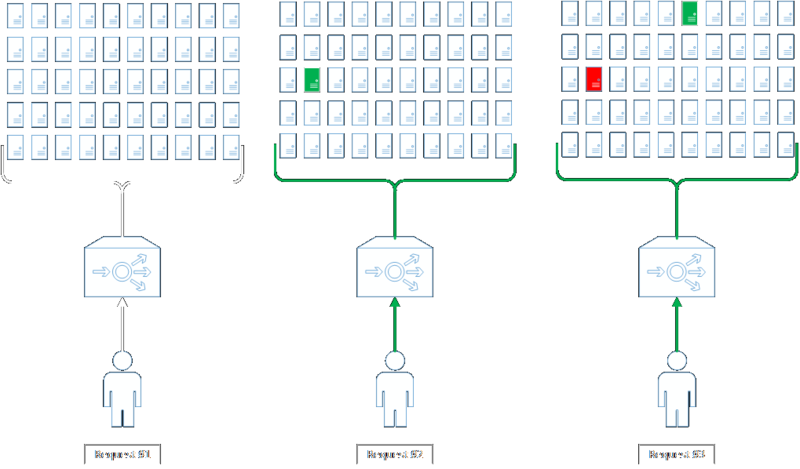 As you might imagine based on the interaction patterns described thus far, simply enabling the BLOB cache can work wonders to reduce the load on your SQL Servers (where content databases are housed) and reduce back-end network traffic. Where things get really interesting, though, is on the client side of the equation (that is, the Requester’s machine) once a resource has been fetched. What about the max-age attribute? Before explaining exactly what the max-age attribute does, I think it’s important to first address what it doesn’t do and dispel a misconception that I’ve seen a number of times. The max-age attribute has nothing to do with how long items stay within the BLOB cache on the WFE’s file system. max-age is not an expiration period or window of viability for content on the WFE. The server-side BLOB cache isn’t like other caches in that items expire out of it. New assets will replace old ones via a maintenance thread that regularly checks associated site collections for changes, but there’s no regular removal of BLOB items from the WFE’s file system BLOB cache simply because of age. max-age has nothing to do with server side operations. So, what does the max-age attribute actually do then? Answer: it controls information that is sent to requesters for purposes of specifying how BLOB items should be cached by the requester. In short: max-age controls client-side cacheability. You might be saying, “hey, wait a minute … there’s only one step there. The request doesn’t even go to the WFE?” That’s right: the request doesn’t go to the WFE. It gets served directly from local browser cache – assuming such a cache is in use, of course, which it typically is. The Cache-Control header line in this case differs quite a bit from the one that was specified when BLOB caching was disabled. First, the use of public instead of private tells the receiving browser or application that the response payload can be cached and made available across users and sessions. The response header max-age attribute maps directly to the value specified in the web.config, and in this case it basically indicates that the payload is valid for 12 hours (43,200 seconds) in the cache. During that 12 hour window, any request for the payload/resource will be served directly from the cache without a trip to the SharePoint WFE. On the plus side, serving resources directly out of the client-side cache for a period of time can dramatically reduce requests and overall traffic to WFEs. This can be a tremendous bandwidth saver, especially when you consider that assets which are BLOB cached tend to be larger in nature – images, media files, etc. At the same time, serving resources directly out of the cache is much quicker than round-tripping to a WFE – even if the round trip involves nothing more than an HTTP 304 response to say that a cached resource may be used instead of being retrieved. While serving items directly out of the cache can yield significant benefits, I’ve seen a few organizations get bitten by BLOB caching and excessive max-age periods. This is particularly true when BLOB caching and long max-age periods are employed in environments where images and other BLOB cached resources are regularly replaced and changed-out. Let me illustrate with an example. Suppose a site collection that hosts collaboration activities for a graphic design group is being served through a Web application zone where BLOB caching is enabled and a max-age period of 43,200 seconds (12 hours) is specified. One of the designers who uses the site collection arrives in the morning, launches her browser, and starts doing some work in the site collection. Most of the scripts, CSS, images, and other BLOB assets that are retrieved will be cached by the user’s browser for the rest of the work day. No additional fetches for such assets will take place. In this particular scenario, caching is probably a bad thing. Users trying to collaborate on images and other similar (BLOB) content are probably going to be disrupted by the effect of BLOB caching. The max-age value (duration) in-use would either need to be dialed-back significantly or BLOB caching would have to be turned-off entirely. There’s one more very important point I want to make when it comes to BLOB caching and the use of the max-age attribute: the default <BlobCache /> element doesn’t come with a max-age attribute value, but that doesn’t mean that there isn’t one in-use. If you fail to specify a max-age attribute value, you end up with the default of 86,400 seconds – 24 hours. This wasn’t always the case! In some recent exploratory work I was doing with Fiddler, I was quite surprised to discover client-side caching taking place where previously it hadn’t. When I first started playing around with BLOB caching shortly after MOSS 2007 was released, omitting the max-age attribute in the <BlobCache /> element meant that a max-age value of zero (0) was used. This had the effect of caching BLOB resources in the file system cache on WFEs without those resources getting cached in public, cross-session form on the client-side. To achieve extended client-side caching, a max-age value had to be explicitly assigned. Somewhere along the line, this behavior was changed. I’m not sure where it happened, and attempts to dig back through older VM images (for HTTP response comparisons) didn’t give me a read on when Microsoft made the change. If I had to guess, though, it probably happened somewhere around service pack 1 (SP1). That’s strictly a guess, though. I had always gotten into the habit of explicitly including a max-age value – even if it was zero – so it wasn’t until I was playing with the BLOB caching defaults in a SharePoint 2010 environment that I noticed the 24 hour client-side caching behavior by default. I then backtracked to verify that the behavior was present in both SharePoint 2007 and SharePoint 2010, and it affected both authenticated and anonymous users. It wasn’t a fluke. So watch-out: if you don’t specify a max-age value, you’ll get 24 hour client-side caching by default! If users complain of images that “won’t update” and stale BLOB-based content, look closely at max-age effects. As I was finishing up this post, I decided that it would probably be a good idea to see if anyone else had written on this topic. My search quickly turned up Chris O’Brien’s “Optimization, BLOB caching and HTTP 304s” post which was written last year. It’s an excellent read, highly informative, and covers a number of items I didn’t go into. Throughout this post, I took the viewpoint of a SharePoint administrator who is seeking to control WFE load and Internet bandwidth consumption. Chris’ post, on the other hand, was written primarily with developer and end-user concerns in mind. I wasn’t aware of some of the concerns that Chris points out, and I learned quite a few things while reading his write-up. I highly recommend checking out his post if you have a moment. This post investigates manual flushing of the MOSS BLOB cache via file system deletion, why such flushes might be needed, and how they should be carried out. Some common troubleshooting questions (and answers to them) are also covered. It’s a fact of life when dealing with many caching systems: for all the benefits they provide, they occasionally become corrupt or require some form of intervention to ensure healthy ongoing operation. The MOSS Binary Large Object (BLOB) cache, or disk-based cache, is no different. Is BLOB Cache Corruption a Common Problem? In my experience, the answer is “no.” The MOSS BLOB cache generally requires little maintenance and attention beyond ensuring that it has enough disk space to properly store the objects it fetches from the lists within the content databases housing your publishing site collections. How Should a Flush Be Carried Out? When corruption does occur or a cache flush is desired for any reason, the built-in “Disk Based Cache Reset” option is typically adequate for flushing the BLOB cache on a single server and single web application zone. This option (circled in red on the page shown to the right) is exposed through the Site collection object cache menu item on a publishing site’s Site Collection Administration menu. Executing a flush is as simple as checking the supplied checkbox and clicking the OK button at the bottom of the page. When a flush is executed in this fashion, it affects only the server to which the postback occurs and only the web application through which the request is directed. If a site collection is extended to multiple web applications, only one web application’s BLOB cache is affected by this operation. 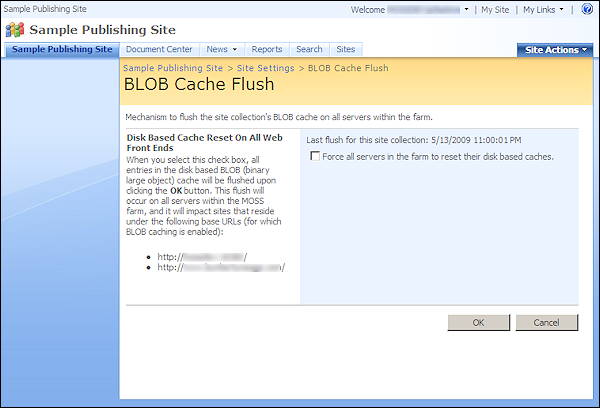 Alternatively, my MOSS 2007 Farm-Wide BLOB Cache Flushing Solution (screenshot shown on the right) can be used to clear the BLOB cache folders associated with a target site collection across all servers in a farm and across all web applications (zones) serving up the site collection. This solution utilizes a different mechanism for flushing, but the net effect produced is the same as for the out-of-the-box (OOTB) mechanism: all BLOB-cached files for the associated site collection are deleted from the file system, and the three BLOB cache tracking files for each affected web application (IIS site) are reset. For more information on the internals of the BLOB Cache, the flush process, and the files I just mentioned, see my previous post entitled We Drift Deeper Into the Sound … as the (BLOB Cache) Flush Comes. Okay, I Tried a Flush and it Failed. Now What? If the aforementioned flush mechanisms simply aren’t working for you, you’re probably staring down the barrel of a manual BLOB cache flush. Just delete all of the files in the target BLOB cache folder (as specified in the web.config) and you should be good to go, right? Jumping in and simply deleting files without stopping requests to the affected site collection (or rather, the web application/applications servicing the site collection) risks sending you down the road to (further) cache corruption. This risk may be small for sites that see little traffic or are relatively small, but the risk grows with increasing request volume and site collection size. Allow me to illustrate with an example. Let’s say that you decided to manually clear the BLOB cache for a sizable publishing site collection that is heavily trafficked. You go into the file system, find your BLOB cache folder (by default, C:\blobCache), open it up, select all files and sub-folders contained within, and press the <Delete> key on your keyboard. Deletion of the BLOB cache files and sub-folders commences. Deleting the sub-folders and files isn’t an instantaneous operation, though. It takes some time. While the deletion is taking place, let’s say that your MOSS publishing site collections are still up and servicing requests. The web applications for which BLOB caching is enabled are still attempting to use the very folders and files currently being deleted. For the duration of the deletion, a race condition is in effect that can yield some fairly unpredictable results. Consider the following possible execution sequence. Note: this example is hypothetical, but I’ve seen results on multiple occasions that infer this execution sequence (or something similar to it). The deletion operation deletes one or more of the .bin files at the root of a web application’s BLOB cache folder. These files are used by MOSS to track the contents of the BLOB cache, the number of times it was flushed, etc. A request for a resource that would normally be present in the BLOB cache arrives at the web server. An attempted lookup for the resource in the BLOB cache folder fails because the .bin files are gone as a result of the actions taken in the last step. The absence of the .bin files kicks off some housekeeping. Ultimately, a “fresh” set of .bin files written out. The requested resource is fetched into the BLOB cache (sub-)folder structure and the .bin files are updated so that subsequent requests for the resource are served from the file system instead of the content database. The deletion operation, which has been running the whole time, deletes the file and/or folder containing the resource that was just fetched. Once the deletion operation has concluded, a resource that was fetched in step #4 is tracked in the BLOB cache’s dump.bin file, but as a result of step #5, the resource no longer actually exist in the BLOB cache file system. Net effect: requests for these resources return HTTP 404 errors. Since image files are the most common BLOB-cached resources, broken link images (for example, that nasty red “X” in place of an image in Internet Explorer) are shown for these tracked-but-missing resources. No amount of browser refreshing brings the image back from the server; only an update to the image in the content database (which triggers a re-fetch of the affected resource into the BLOB cache) or another flush operation fixes the issue as long as BLOB caching remains enabled. The key to avoiding the type of corruption scenario I just described is to ensure that requests aren’t serviced by the web application or applications that are tied to the BLOB cache. Luckily, this is accomplished in a relatively straightforward fashion. Before attempting either of the approaches I’m about to share, though, you need to know where (in the server file system) your BLOB cache root folder is located. By default, the BLOB cache root folder is located at C:\blobCache; however, most conscientious administrators change this path to point to a data drive or non-system partition. If you are unsure of the location of the BLOB cache root folder containing resources for your site collection, it’s easy enough to determine it by inspecting the web.config file for the web application housing the site collection. 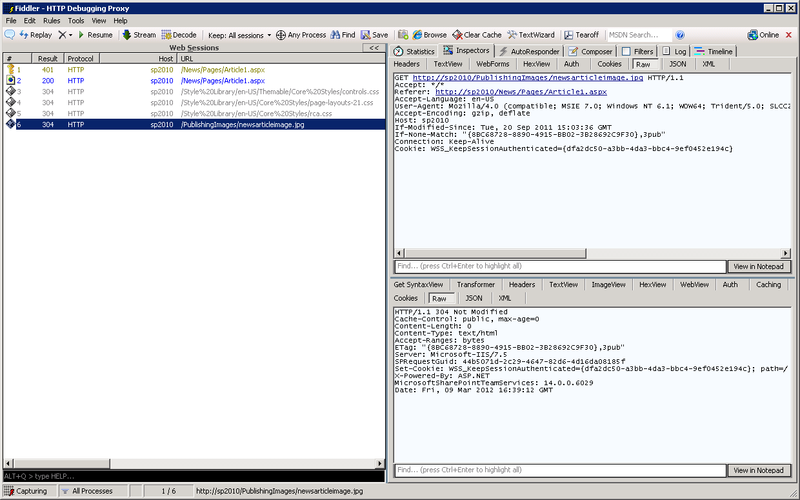 As shown in the sample web.config file on the right, the location attribute of the <BlobCache> element identifies the BLOB cache root folder in which each web application’s specific subfolder will be created. Be aware that saving any changes to the web.config file will result in an application pool recycle, so it’s generally a good idea to review a copy of the web.config file when inspecting it rather than directly opening the web.config file itself. Stop the World Wide Web Publishing Service on the target server. This can be accomplished from the command line (via net stop w3svc) or the Services MMC snap-in (via Start –> Administrative Tools –> Services) as shown on the right. Once the World Wide Web Publishing Service stops, simply delete the BLOB cache root folder. Ensure that the deletion operation completes before moving on to the next step. Restart the World Wide Web Publishing service (via Services or net start w3svc). Though this approach is quick with regard to time and effort invested, it’s certainly “dirty,” coarse, and not without disadvantages. Using this approach prevents the web server from servicing *any* web requests for the duration of the operation. This includes not only SharePoint requests, but requests for any other web site that may be served from the server. Second, the “quick and dirty” approach wipes out the entire BLOB cache – not just the cached content associated with the web application housing your site collection (unless, of course, you have a single web application that hasn’t been extended). This is the functional equivalent of trying to drive a nail with a sledgehammer, and it’s typically overkill in most production scenarios. There is a less invasive alternative to the “Quick and Dirty” technique I just described, and it is the procedure I recommend for production environments and other scenarios where actions must be targeted and impact minimized. The screenshots that follow are specific to IIS7 (Windows Server 2008), but the fundamental activities covered in each step are the same for IIS6 even if execution is somewhat different. Determine the IIS ID of the web application servicing the site collection for which the flush is being performed. This is easily accomplished using the Internet Information Services (IIS) Manager (accessible through the Administrative Tools menu) as shown to the right. 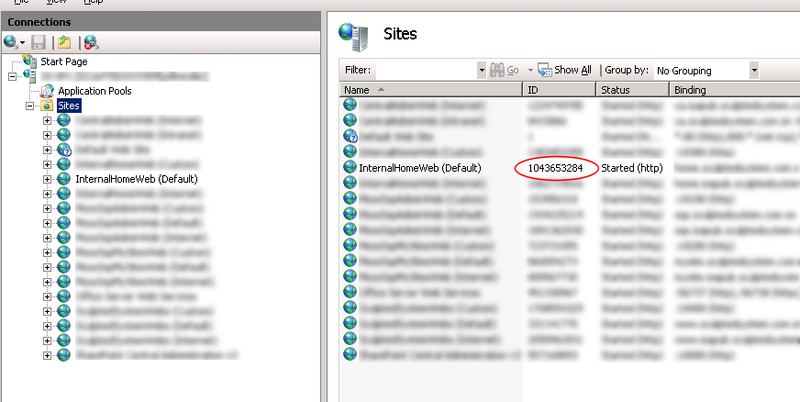 If I’m interested in clearing the BLOB cache of a site collection that is hosted within the InternalHomeWeb (Default) web application, for example, the IIS site ID of interest is 1043653284. Determine the name of application pool that is servicing the web application. In IIS7, this is accomplished by selecting the web application (InternalHomeWeb (Default)) in the list of sites and clicking the Basic Settings… link under Edit Site in the Site Actions menu on the right-hand side of the window. 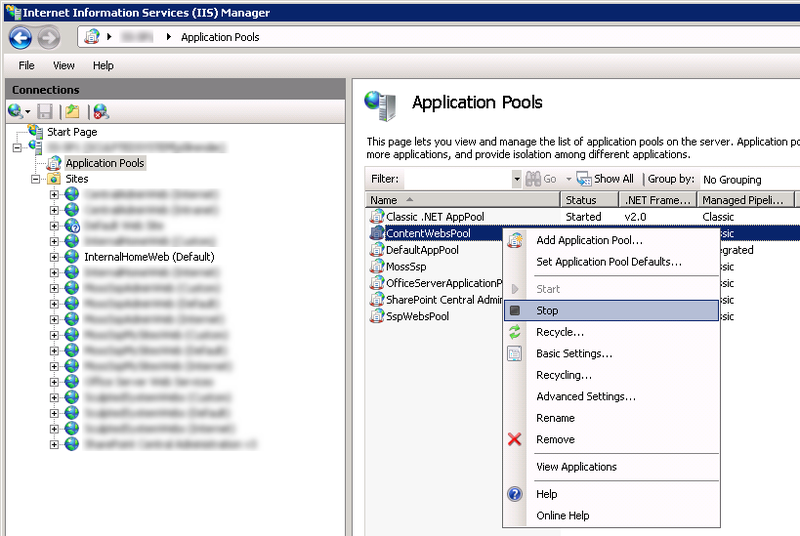 The dialog box that pops up clearly indicates the name of the associated application pool (as shown on the right, circled in red). Note the name of the application pool for the next step. Open Windows Explorer and navigate to the BLOB cache root folder. For the purposes of this example, we’ll assume that the BLOB cache root folder is located at E:\MOSS\BLOB Cache. Within the root folder should be a sub-folder with a name that matches the IIS site ID determined in step #1 (1043653284). Either delete the entire sub-folder (E:\MOSS\BLOB Cache\1043653284), or select the files within the sub-folder and delete them (as shown above). Once the deletion has completed, restart the application pool that was shutdown in step #3. If the World Wide Web Publishing Service was shutdown instead, restart it. Taking the approach just described affects the fewest number of cached resources necessary to ensure that the site collection in question (or rather, its associated web application/applications) starts with a “clean slate.” If web applications are partitioned across multiple application pools, then this approach also restricts the resultant service outage to only those site collections ultimately being served by the application being shutdown and restarted. Q: I have multiple servers or web front-ends. Do I need to take them all down and manually flush them as a group? The BLOB cache on each MOSS server operates independently of other servers in the farm, so the answer is “no.” Servers can be addressed one at a time and in any order desired. Q: I’ve successfully performed a manual flush and brought everything back up, but I’m *still* seeing an old image/script/etc. What am I doing wrong? 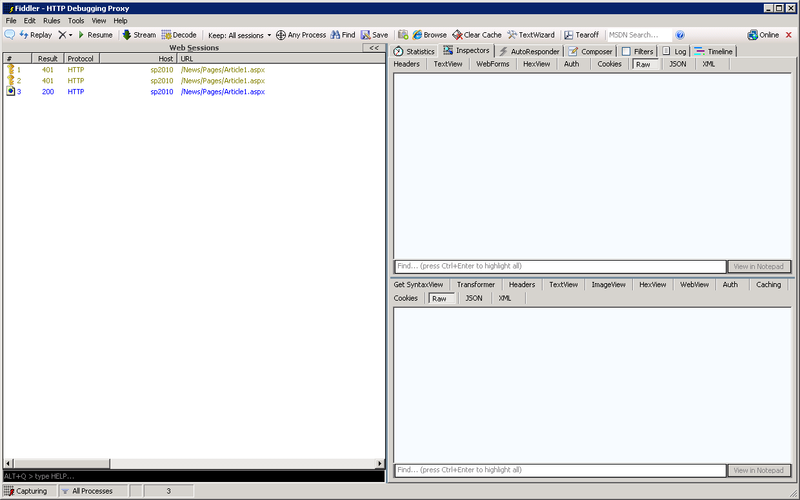 Interestingly enough, this type of scenario oftentimes has little to do with the actual server-side BLOB cache itself. One of the attributes that can (and should) be configured when enabling the BLOB cache is the max-age attribute. The max-age attribute specifies the duration of time, in seconds, that client-side browsers should cache resources that are retrieved from the MOSS BLOB cache. Subsequent requests for these resources are then served directly out of the client-side cache and not made to the MOSS server until a duration of time (specified by the max-age attribute) is exceeded. If a BLOB cache is flushed and it appears that old or incorrect resources (commonly images) are being returned when requested, it might be that the resources are simply cached on the local system and being returned from the cache instead of being fetched from the server. Flushing locally-cached items (or deleting “Temporary Internet files” in Internet Explorer’s terminology) is a quick way to ensure that requests are being passed to the SharePoint server. Q: I’m running into problems with a manual deletion. Sometimes all files within the cache folder can’t be deleted, or sometimes I run into strange files that have a size of zero bytes. What’s going on? I haven’t seen this happen too often, but when I have seen it, it’s been due to problems with (or corruption in) the underlying file system. If regular CHKDSK operations aren’t scheduled for the drive housing the BLOB cache, it’s probably time to set them up.